In The Crazy Ones, Robin Williams plays Simon Roberts, the attention-challenged head of a father-and-daughter advertising agency. In the pilot episode (airdate: 9/26/13), the agency is about to lose the McDonald's account, which comprises 60% of its business. After learning of the impending loss, Roberts laments his inability to save the company. Doing a fine impression of Chief Dan George, he says:It is over, little one. You must treat this like a cleansing fire. You will rebuild from the ashes. And I, like a tribal elder, shall climb onto the ice floe and drift to my death in the Arctic night. It is a good thing. It will be a circle of life. [mumbles Native-sounding nonsense. ]Comment: Like the recent Modern Family episode, this is another ambiguous depiction of Native culture and history. On the one hand, Roberts is obviously mocking himself. 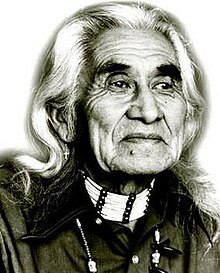 And he's using Chief Dan George, who famously mocked himself in Little Big Man. So on one level, we're not supposed to take his comments seriously. On the other hand, nothing in his comments themselves is obviously false. Roberts suggests that Indians abandoned their elders to die, and who knows if they did or not? Not me. Indeed, some tribes may have done this, although I'm guessing most didn't. But the idea feeds into the common perception that Indians were uncivilized and barbaric. We would never abandon our elders, the thinking goes, but those subhuman savages probably did. So the character's tone his mocking, but his claim is plausible. What would the average viewer think? That because Robin Williams was doing his usual shtick, the Indian lore must be inauthentic? Or that Williams was using authentic Indian lore to put down his character? I don't know, and I don't think it's clear. That's why I say this bit is ambiguous. Then there's the "circle of life" line. And the use of a 19th-century character, Chief Dan George in Little Big Man, to impart this "wisdom." The implication is that Indians were wise stewards of nature. Which is partly true, but it stereotypes Indians as primitive people of the past. Who have nothing else to offer--indeed, who have vanished from the scene since the Indian Wars ended. Overall, the bit is a nice try to include Native culture. With a little tweaking, the writers could've made it work. As it stands, though, I'd say it ultimately fails. in the artic the old used to walk off to die and the ice and snow. As I said, some tribes may have done it. Williams's comment implied it was the norm, not the exception. I'd say that's stereotypical.